Your blood volume doubles, your sleep diminishes, and your hormones go into a whirlwind. Pregnancy and giving birth is a life-changing experience—just ask your pelvic floor and muscles. “As the uterus grows, the muscles on the front side of the body begin to stretch, which allows the pelvis to take on an anterior pelvic tilt. These common pregnancy compensations hang around for awhile after birth,” explains Crystal Widmann, CPT, and postnatal fitness specialist. So, it’s important to zero-in and focus on getting your interior back into tip-top shape. After you’ve been given the green light by your OB-GYN, try these postpartum pelvic exercises for your post-pregnancy regimen. Pair other moves with Kegels. Lay on your back with your knees bent and your feet on the floor. Inhale deeply through your nose. As you exhale, forcefully draw your navel back to your spine, tipping your hip points up toward the rib cage. At the same time, tilt your pelvic floor up from the base to the top, sort of like you’re zipping up a pair of pants. Hold the contraction of both of these muscles for two counts, release. Repeat for two sets of ten—or as many as you’d like. Find your postural alignment in a mirror. Stand with one side of your body facing a mirror. Shift your body until you feel equal weight in all four corners of the foot. Align your knees directly over the ankle. Tip your hip points up one inch toward the rib cage. Pull the naval into your spine, as if you’re wrapping a corset around your waist. Pin your rib cage down to prevent over-lifting your chest. Try to do this several times during the day to retrain your postpartum body. Use the mirror to help check your body position. Widmann says that this might feel odd at first. But it will make a difference in your posture and your form when you’re working up a sweat. You probably became quite familiar with the nooks-and-crannies of your body over the past nine or so months. 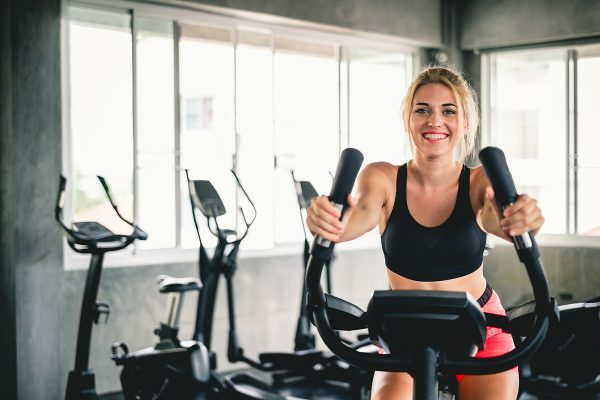 But, Widmann says, you could have lost some of the deep engagement you used to have pre-baby, since your focus was more on creating a safe haven for your newborn, rather than challenging workouts. She suggests rebuilding that connection with the use of resistance bands and this postpartum pelvic exercise. Hold a long resistance band taut overhead with both of your hands. Inhale deeply. As you exhale, pull the band down so that your arms form a ‘T’ at your shoulders. While you’re pulling your arms down, lift your pelvic floor up and forward, as if you’re zipping a pair of pants. Hold this contraction for two counts and release. Repeat two sets of ten—or as many as you like. Lay flat on your back or side (or you can stand up) and picture your diaphragm as a parachute attached to the lower part of your lungs, under your rib cage. Inhale deeply like you’re filling up the parachute, keeping your upper body relaxed. Exhale deeply, deflating the parachute. After a few rounds of this, add pelvic floor muscle moves, by drawing them inwards as you exhale. Janicola recommends using other movements too—like glute bridges and squats—along with postpartum pelvic exercises to build your endurance and vitality. “Learning which exercises to incorporate into a workout, and then practicing the breathing practices while doing these exercises, can retain, restore, and improve health and function in the pre- and postnatal periods of a woman’s life,” she adds. First step, identify what it is. Learn about what causes joint cracking, why it occurs, and if your cracking joints are a sign of injury. How Does #TeamAaptiv Find Time for Fitness? We asked the Aaptiv community how they make fitness a seamless part of their lives.